Due to outdated and inaccessible display cases, as well as inappropriate furnishings, many of the exhibits in the London Natural History Museum whale hall gallery were subject to damage from dirt and pests. A proposed – but still to be realised – gallery redevelopment delayed plans to address the situation. But, once the necessity of the works had been agreed, the Exhibition and Conservation team carried out a full refurbishment of the cases so that any pest infestations would be more visible. This was achieved with a view to minimising risk, time and cost and, six years on, the cases have remained dust and debris free, and straight forward to inspect. 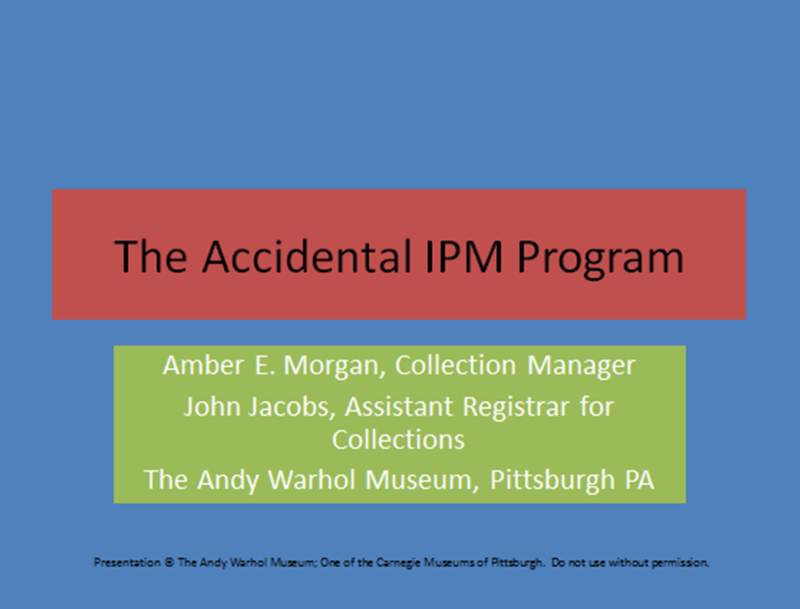 The Andy Warhol Museum (AWM) recently battled an infestation in their archives processing area. 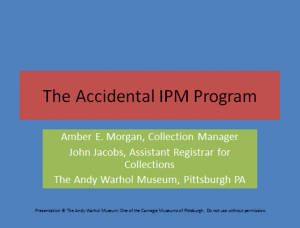 During this presentation, the Associate and the Assistant Registrars for Collections will describe how the infestation was discovered, what the immediate response was, and how a complete Integrated Pest Management program evolved out of their experiences. 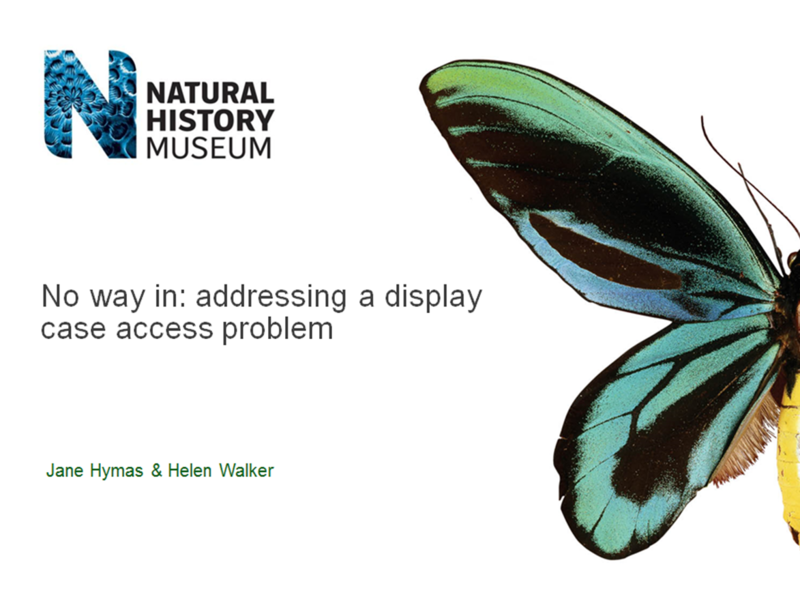 The presentation will discuss the importance of collaborating with other departments, museums, and pest experts. It describes the benefits of developing policies and procedures that define and prioritize an institution’s IPM needs. It highlights AWM’s prevention, detection and documentation strategies. It also showcases some innovative solutions developed to address the unique collections of traditional and non-traditional media held by AWM. Insect pest are enemies of the library, sheltering inside books and bookshelves, crawling and flying in the library. Library pests thrive in tropical climates like that of Sri Lanka, hence libraries in the tropical region are particularly affected by the pest attacks. As they feed and reproduce, these pests cause irreversible damage to the books. 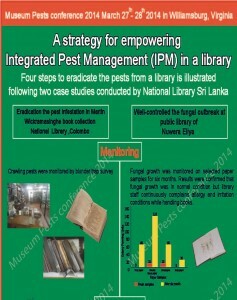 A four step IPM program involving prevention, monitoring, identification, and treatment (both of the infestation and of the book collections), has been used in libraries in Sri Lanka. This paper will describe two case studies where IPM was used to control or rid libraries of infestations; a fungal outbreak in public libraries in Sri Lanka and an infestation of Lasioderma Serricorne in Sri Lanka’s National Library. A common problem within libraries and archives comes from irreparable loss or damage to collections resulting from an attack of insect pests. 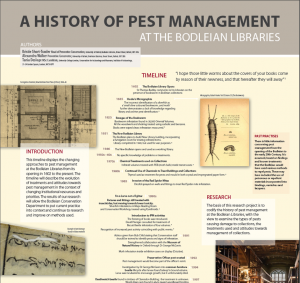 The Bodleian Libraries have been practising ad hoc pest management activities in some form or other since the early 1940s when it was noted that the New Bodleian Library was provided with a “fumigation chamber that deals destruction to bookworms” (Craster 1946, p. 336). Since then, the libraries have evolved from ad hoc and reactive activities such as fumigation to a more centralised integrated pest management program (IPM). The program includes pest zoning, regular trapping and identification and treatments. The libraries also routinely monitor our environments where trapping is carried out and this data is regularly cross-checked for possible relationships. Over the years, the data show a direct correlation between insect populations and environmental changes, housekeeping practices, localised building issues and control treatments. This paper will review our IPM program activities, the main sources of our library pests and how the data gathered over the years has been used to identify issues and inform decision making for storage, use and treatment of the collections. The Oxford University Museum of Natural History houses many historically and scientifically important specimens in the fields of Life and Earth Sciences. These specimens, composed of organic materials, are naturally vulnerable to damage by pests. The collections are housed in a 19th century building meaning that the storage facilities available do not reflect best practice. The result of this has been continuous pest infestation and in the worst cases, irreversible damage to the specimens. 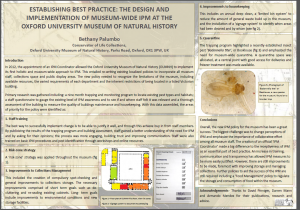 This poster details the processes that OUMNH began implementing in 2012 as part of its first museum-wide IPM policy. The biggest challenge was to change the perception of IPM within the museum and promote the importance of collaborative effort among all museum staff. An increase of communication and transparency has allowed the preventive measures to be more easily implemented and for the IPM policy to be greater success. Egyptian antiquities are a window to the civilizations of the past and must be preserved. The Grand Egyptian Museum – Conservation Center (GEM-CC) facility containing a large amount of archaeological objects is located in a desert area which substantial populations of insect pests. As a result an IPM project was implemented in collaboration with the Japan International Cooperation Agency (JICA) which supported the project with all the required tools and materials to keep it and its archaeological collections safe from the microbiological attacks. The plan was started by dividing GEM-CC into three main areas. The goal of this step is to compare the different areas as each area has its own climatic conditions. Implementing the IPM plan began by performing several steps such as closing gaps and cracks, usage of insect attractors and removing plants. Data was collected and analyzed surveying both the laboratories and storages area. 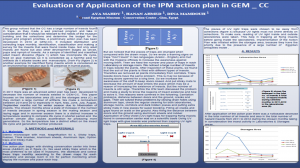 In this poster the results from April, May, June, July, August and September for the both years 2011 and 2012 are compared and show that the total number of all insects and total number of harmful insects on artifacts were decreased clearly in 2012 after introduction of the IPM plan especially in storage area. The IPM team succeeded in reducing and controlling the insect pests in the GEM – CC, so they are on their way to making it a “green museum”.